Perhaps to the dismay of Sabres fans it is official. 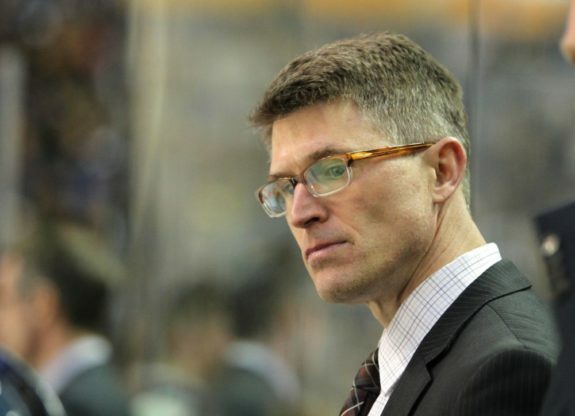 Ron Rolston has had the interim tag removed and is the 16th coach in the history of the Buffalo Sabres, joining the likes of Scotty Bowman, Punch Imlach and Ted Nolan to name a few. Rolston took over the bench from Lindy Ruff for the Sabres Dec. 21st game and guided the team to a 15-11-5 record after they stumbled out of the blocks to a 6-10-1 start and now has a multi-year contract, although length was not announced. The announcement to promote Rolston to the full time gig came at a press conference on May 7. “I am familiar with the players and their capabilities,” remarked Rolston at the Press conference. It is true that Rolston does have an advantage having the prior knowledge of the team. 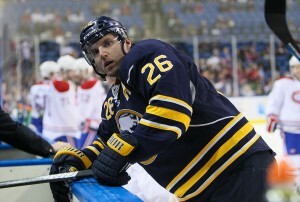 In addition, since Rolston spent nearly two season’s with the team’s American Hockey League affiliate, the Rochester Americans, he is not only familiar with the current roster, but also the players that are in the system. A reoccurring theme with the press conference was the notion of “freshness.” Fans and followers of the team have come to almost demand it, but Regier and Rolston were able to point to where they believed the “freshness” will come from. “The young players will add to the Freshness. 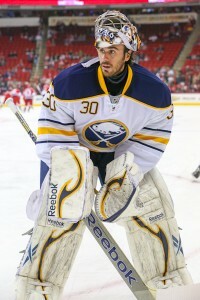 We will create a good buzz and closeness so that the guys are playing for one another,” said Rolston. Breaking down these statements, it seems as though the changes, if any, will be in personnel and that players from within will create the change that fans are looking for. The question is will it be enough to turn the team around? Both the general manager and coach re-instilled that players will have to earn opportunities. Much like Regier’s press conference last week, Rolston preached patience and that there will be a process to building the team to not only be a playoff contender but to make a long run and win a Stanley Cup. However how long will this process take? Both men wouldn’t put a timetable on it. One area that will be under heavy scrutiny will be if Rolston can find a way to tap into that potential that Myers has shown so that he can live up to his heavy contract. A player that Rolston did point out was Mike Weber and his role as a leader when talking about accountability. “Weber took a big jump this year especially in terms of a leadership role.” The coach pointed to successful teams as all having an accountable room, something he hopes to establish. With these statements there is a lot that will certainly be questioned. If Rolston feels there was not enough accountability from the current leadership group and he is going to establish his own, what does that mean for guys like Miller and Vanek, who just minutes earlier he wanted in his opening day line up? Are these hints at player personnel change or just words to satisfy the fan base? Regier’s talk about a good leadership core furthers the speculation that both Miller and Vanek could be on the way out, if the right deal comes along. Rolston addressed the rest of his staff stating that he will evaluate his assistants and anticipates decisions on their futures by the end of the week. Rolston gave credit to the assistants he worked with acknowledging that it can be difficult to be left over from a previous staff. He also noted that the three assistants James Patrick, Kevyn Adams and Teppo Numminen were very professional to work with. With everything that was discussed, it is still hard to determine what exactly the Sabres plan to do moving forward. They stress that they will have a fresh look but at the same time don’t seem to want to stray away from the way things are. Either way Rolston now has his opportunity to shape the team to his liking but he cannot be afraid to make changes and take chances or else the team is doomed to remain mediocre.